That’s not just because the ABBA musical has played in more than 400 cities in 40 countries. 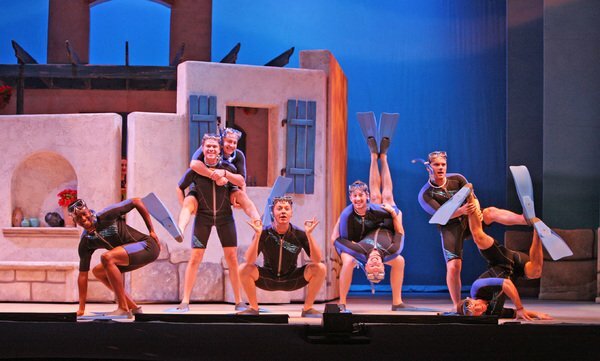 It’s international because British playwright Catherine Johnson took songs from a Swedish group, set her show in Greece and gave it an Italian title. Let’s get the United States in there, too. After Mamma Mia! came to New York in 2001, it stayed almost fourteen years, making it the eighth-longest run in Broadway history. It’s the only book musical to run over 5,000 performances without getting a single Tony award. Cast members of Mamma Mia! at Music Theatre Wichita (Photo by Christopher Clark). Now regional theaters are staging Mamma Mia! That its set could fit into a moderately-sized U-haul will make budget-conscious groups strongly consider this for upcoming seasons. But more directors will choose it because Mamma Mia! has been providing fun ever since its 1999 London premiere. Last month at the three performances I saw at Music Theatre Wichita, each audience gave the show a standing ovation. All right, which audience doesn’t? However, when theatergoers realize that a musical isn’t yet over and that a Big Finish Mega-Mix is coming, they usually sit. Here each audience stood for the entire (I timed it) six minutes and 51 seconds. One could say that the reaction solely came because Mamma Mia! is a feast for the ears (thanks to Benny Andersson and Björn Ulvaeus’ astonishing gift for melody) and eyes (plenty of vividly colored beachwear is carefully tailored to show more than a modicum of skin). No, what really makes us love a show is when it engages our hearts, too. Director Wayne Bryan knew that the key to any successful production is in the lyric “Don’t go wasting your emotion.” He cast two extraordinary performers who’d never be accused of wasting it. Lexis Danca was Sophie, the bride-to-be who wants the father she’s never known to attend her wedding and give her away. A peek at her mother’s diary from 20 years earlier allows her to narrow the candidates to architect Sam Carmichael (an appealing Vincent Corazza), travel writer Bill Austin (a sharp Damon Kirsche) and banker Harry Bright (a full-of-fun Thom Sesma). Kim Huber portrayed Donna, who can’t understand why these men from her distant past are now at her tavern on this remote Greek island. Until they arrived, Donna was busy trying to understand why Sophie would want to marry at the tender age of 20. But not rebutting your kid is one of the greatest gifts a mother can give her daughter. While Johnson’s script contains tenderness, Danca and Huber greatly added to it. They made us see the loving bond that these two have shared for 20 years, mostly because they’ve only had each other to love. And what about Sophie’s choice of husband? Musicals have been littered with men who deceive women. Sky Masterson in Guys and Dolls implies he’s not plying Sarah Brown with liquor when he indeed is. Sky in this show instead feels victimized when he learns that Sophie has been keeping from him that she’d invited the father candidates to the ceremony. Now he must wonder if the whole Big White Wedding thing was a more a ruse to find her dad than to marry him. 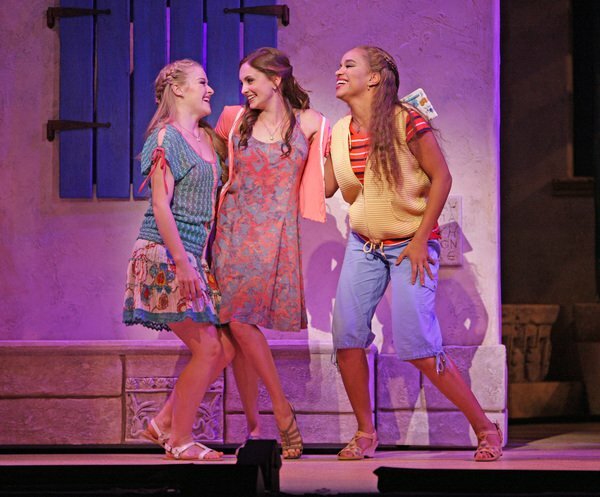 Daisy Wright, Lexis Danca and Cameron Anika Hill in Mamma Mia! at Music Theatre Wichita (Photo by Christopher Clark). Sky is always played by someone macho, and Quinn Heron certainly is. But he also managed to show terrible hurt and made the Wichita audiences feel for him. Again: emotion. With all of Sophie’s friends on board, Mamma Mia! offers just about as many good roles for twentysomethings as for middle-agers. There are Sophie’s friends (endearingly played by the delightful Daisy Wright and Cameron Anika Hill) and Donna’s back-up singers from her youth (a hilariously acerbic Paula Leggett Chase and a centered Karen L. Robu). When rehearsals begin, you may find that each age group expects a generation gap that won’t be bridged. After the closing performance in Wichita, tears flowed and hugs abounded between the youngest and oldest members of the cast. How’s that for emotion?